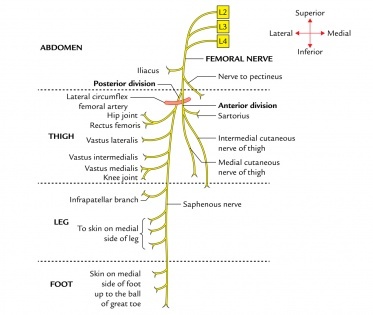 The femoral nerve is the largest branch of the lumbar plexus. The nerve descends from the lumbar plexus in the abdomen, travelling down through the fibres of psoas major. The nerve exits psoas major at the lower part of its lateral border, passing behind the iliac fossa to approximately the mid-point of the inguinal ligament. It then traverse below the inguinal ligament of about 4 cm into the thigh and splits into an anterior and posterior division.The lateral circumflex femoral artery is straddled by both sections.The nerve enters the femoral triangle by passing beneath the inguinal ligament, just lateral to the femoral artery. In the thigh,it lies outside the femoral sheath , gives off articular branches to the hip and knee joints. The terminal cutaneous branch of the femoral nerve is the saphenous nerve which continues, with the femoral artery and vein, through the adductor canal. The first motor branch innervates iliacus. This muscle, in conjunction with the psoas major, causes medial rotation of the hip. The anterior branch of the femoral nerve then descends to supply the sartorius (the tailor’s muscle). 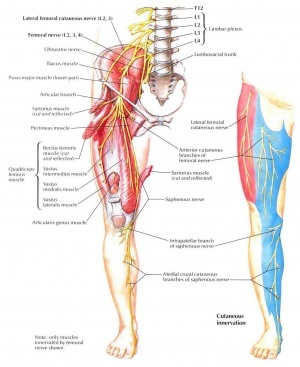 Once it passes through the femoral canal (as the most lateral structure of the neurovascular bundle), it supplies the pectineus, a small muscle in the medial compartment of the thigh. Finally, the posterior branch of femoral nerve supplies the four heads of the quadriceps femoris (vastus medialis, vastus lateralis, vastus intermedius and rectus femoris).The articularis genu is supplied by a branch of the nerve to vastus intermedius. The anterior (superficial) branch of the femoral nerve first gives rise to the intermediate and medial cutaneous nerve of the thigh. They supply the skin on the anteromedial thigh. The posterior division gives only one cutaneous branch, the saphenous nerve which supplies the skin on the medial side of the foot and leg. The femoral nerve also innervates the capsule of the hip joint and allows for proprioceptive feedback about the joint. The knee joint is supplied by the nerves to the three vasti. The nerve to the vastus medialis contains numerous proprioceptive fibres from the knee joint, accounting for the thickness of the nerve. This is in accordance with Hilton’s law: Nerve supply to a muscle which lies across a joint, not only supplies the muscle, but also supplies the joint beneath and the skin overlying the muscle. To the femoral artery and its branches. Poor flexion of the hip, because of paralysis of the iliacus and sartorius muscles. Inability to extend the knee, because of paralysis of the quadriceps femoris. Sensory decline over the anterior and medial aspects of the thigh, as a result of engagement of the intermediate and lateral cutaneous nerves of the thigh. Sensory loss on the medial side of the leg and foot up to the ball of the great toe (first metatarsophalangeal joint), because of engagement of the saphenous nerve. 3. Femoral nerve neuropathy occurs when the femoral nerve is compressed as it passes under the inguinal ligament, anterior to iliopsoas. Causes include surgery (hysterectomy, pelvic, hip, femoral artery catheterization, arterial bypass, retroperitoneal tumors ,diabetes mellitus).With increased use of anticoagulant agents, femoral neuropathy subsequent to spontaneous hemorrhage within the ileo-psoas muscle has become a serious and more frequent clinical problem. 4. Femoral nerve block (in combination with sciatic nerve block) may be indicated in patients requiring lower limb surgery who cannot tolerate a general anaesthetic. A femoral nerve block can also be used as peri- and post-operative analgesia for patients with a fractured neck of femur who cannot tolerate particular analgesics. ↑ 2.0 2.1 2.2 B D Chaurasia's Human anatomy Volume 2 Regional and Applied Dissection and Clinical Lower Limb , Abdomen and Pelvis (Sixth edition) 2013. India CBS Publisher and Distributors Pvt Ltd.
↑ Casoni P, Dalla RV. Femoral neuropathy due to a spontaneous hematoma of the iliopsoas muscle during therapy with heparin-calcium. Acta bio-medica de L'Ateneo parmense: organo della Societa di medicina e scienze naturali di Parma. 1994;65(5-6):289-96.